The second feature I would like to present is image cropping. At first I didn’t see the big value and Tino had to convince me to focus on this feature. But having used image cropping it is lightning fast to assemble a prototype out of a sample image of interaction elements. 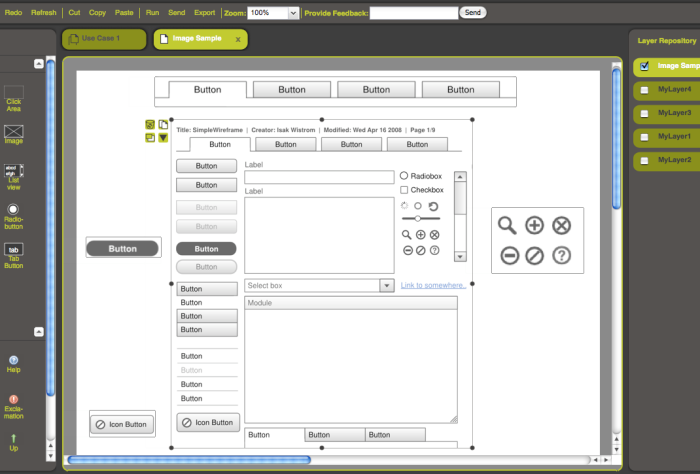 The screenshot below shows in the center the stencil image in its full size. Around this image there are four copies of the same image with different cropping. When you have opened the editor, set the url of an image to your favorite stencils. Then start resizing the image. By pressing the shift key you keep the ratio of the image. By pressing the control button you start cropping the image. You can start cropping or resizing and to both actions in any order for several times until you have the right section of the image. In case you need a button, take such an image, select the right section and then use a click area on top. The click area then specifies the target of the fake button. No matter whether you use some iPhone stencils, your own design, or the corporate design of your customer, it is very easy to get a prototype with some initial graphical design. Use image cropping and accelerate your prototyping!